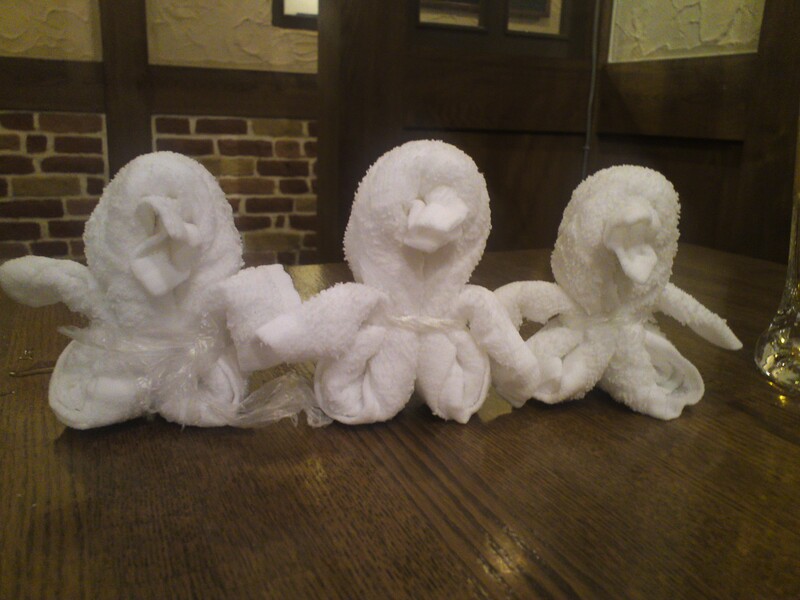 My husband and I were invited to a nomikai, or drinking party, for my office, and my coordinator showed us how to make penguins out of our wet napkins. My husband exclaimed, “Ah, the three amigos!” before we explained to my confused coordinator what it meant. It was a fun party. Unlike American office parties, Japanese office parties normally has tons of alcohol and not the weak kind either. There’s premium beer, sake, and owamori, a strong Okinawan alcohol that holds a candle to vodka or tequila. Most Japanese people can nurse these liquors without doing any gross or sightly damage. My husband, being a newcomer to all things Japanese, was impressed with their drinking and eating ability. What impressed the both of us was when my coordinator told us more about the Okinawan people. “We focus more on relationships here. You can’t buy friendship.” That’s something I’ll always remember. Well, that and the three amigos. This entry was posted in Miscellaneous (雑多) and tagged amigos, bar, drinking, drinks, food, izakaya, Japan (日本), napkins, nomikai, Okinawa, penguins. Bookmark the permalink. ← Yakiniku – Just like the Anime! Hi, just hopped over to this web site from stumbleupon. It’s not blog post I would regularly read, but I liked your spin on it. Thank you for creating something worth reading!